The Giving Challenge is On! For the next 24 hours only, your giving between $25 and $100 is DOUBLED by the Community Foundation of Sarasota County. Will you be the one to make a difference? Here’s how to give. Fill in the rest of the form and submit. Woohoo! The foundation will double a maximum of $100 from each unique donor. If you want to give more than $100 and want to get the best donation possible for the ministry, then individual family members can each make a donation with different credit cards. For example, a husband and wife could split a gift of $200 and each gift of $100 would be doubled. But the foundation will only double a maximum of up to $100 of any unique donor’s gift. The Giving Challenge is provided by the Community Foundation of Sarasota County with giving strengthened by the Patterson Foundation. Tomorrow – Your Giving DOUBLED! Remember, the special link to give will not appear until tomorrow at noon and will disappear 24 hours later. It will be an exciting 24-hour blitz. The last time the foundation matched giving was in 2016. I remember how overwhelmed I was when the event began, and folks like you started giving to support the ministry. I had no idea so many people cared and just wanted an opportunity to have a part in what God is doing through the ministry. It was an emotional roller coaster for 24 hours. Tomorrow I will follow the giving in real-time and will post updates on Facebook and Twitter as the event progresses. Together let us celebrate God’s kindness and faithfulness in meeting all of the ministry’s needs. You can have a part even if you cannot give. Share this information on your social media pages, and share what God has done in your life and relationship with him. Go for it! I always appreciate reading your comments. Please post any comments or questions below. May 1 & 2 noon to noon only! On May 1, beginning at noon, follow the link to the Giving Challenge website. 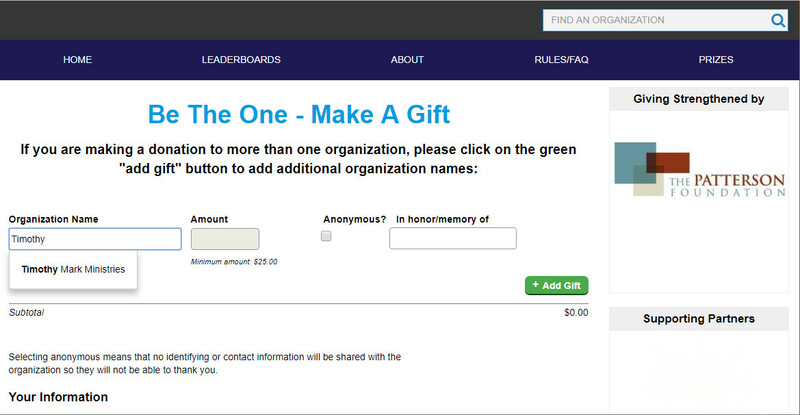 The link to the site is now available but the link to give is not visible until the Giving Challenge begins at noon. We will promote the link on Facebook and Twitter as well as our website as soon as it is available. You can give anytime in the 24-hour period. The Giving Challenge ends at noon on May 2. If you give $25 to the ministry through the Giving Challenge portal, the foundations will match your gift 1:1. This doubles your gift which results in a $50 donation to the ministry. If you give $50, the ministry receives $100. Only gifts made through the special link will qualify for matching funds. Behind the scenes, the Community Foundation of Sarasota County helps us with training to develop the business side of the ministry. Their passion is to equip local non-profit organizations to effectively serve our communities. They created the Giving Challenge to encourage our donors to give and to help us to develop our donor relations. The Giving Challenge is provided by the Community Foundation of Sarasota County with giving strengthened by the Patterson Foundation. As a ministry, we have the most generous supporters. Through the years, thousands of folks have sacrificially given to support the ministry. 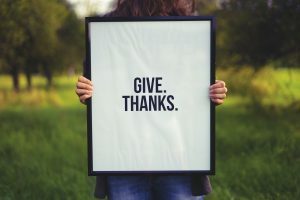 Because our friends give so generously, I am able to minister in churches across the United States and Canada without charging a church for travel expenses or even requiring an honorarium. It is remarkable how God has always provided all that we need. All of our needs are met by God’s kind hand as he moves the hearts of individuals to give. We have no debt. It is humbling to see God provide. If you have any questions, please feel free to email me at timothy@timothymark.com or call me at 941-445-3288. Thank you in advance for all you do! Additional blog that may be of interest: Why we do not ask for support as a ministry. Over the past few months we’ve explored the Wilderness of Testing. I trust you will be encouraged when you understand better how God uses these seasons in our lives. This month, I invite you to explore the Valley of Rest with me. I think you will find refreshment for your journey. To review, often God leads us through a series of places in the journey of our relationship with him. One of those destinations is the Valley of Wait. In the Valley of Wait we learn lessons we cannot learn anywhere else. The lessons are treasures we discover in the valley. 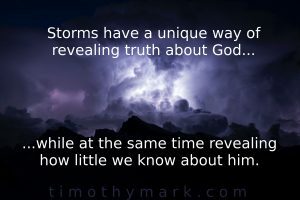 We learn more about who God is and how he relates to us. We relish these riches. 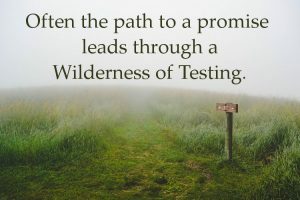 Usually after learning these lessons, God leads us onward to the Wilderness of Testing. It is a place of testing to see what we have learned. Often the Wilderness of Testing is vast and long. This is frequently more difficult than the Valley of Wait, but it is an important destination in our journey. We discover how well we have payed attention during school. We see how God uses the lessons he taught us in the Valley of Wait, and we discover we may need to learn more in specific areas of our lives. Gratefully, after a time of testing, usually he leads us to a place of rest. Here he restores our souls. Our depleted resources are renewed. We find new strength. We are refreshed. Oh, how we would love to stay in the Valley of Rest, but in God’s divine plan he usually leads us to a different place to learn more of him. We start the process anew. It is a cycle repeated over and over as we journey toward home with him. This month, let us explore the Valley of Rest. God leads us to this destination, and it is as important as the Valley of Wait and the Wilderness of Testing. It is as much a part of God’s plan for our lives as the other two experiences. Rest. The word brings to mind images of a Caribbean beach shaded with coconut palms as crystal clear waters lick white sand, hushing in and out in an endless loop. You are stretched out on a lounge chair, sinking between the slats as the heaviness of slumber overcomes you. You smile as you drift off to sleep. This is what many of us think of as rest. But mention “rest” to most people, and you will get different responses. One friend of mine went so far as to describe it as torture. Our lives are over-filled with activity. Rest implies stopping, and this is uncomfortable for many of us. We enjoy keeping busy. Our ideal day is one in which we are productive. But to rest? Not so much. Yet rest is as much a part of God’s plan for our lives as is service. We don’t think of God’s wanting us to rest. We think of serving God, and seek out his will for our lives. Usually this means we seek what God would have us do for him. But what if God wants us to rest? For many of us, this makes us uncomfortable. “The LORD is my shepherd; I shall not want. He makes me lie down in green pastures. He leads me beside still waters. He restores my soul” (Psalm 23, ESV). As a child, David was a shepherd. He spent his days with the sheep. He understood the role of the shepherd in the life of the sheep. In this case, he places himself in the role of the sheep in the care of the shepherd God. “God is my shepherd,” he says. “I lack nothing. He leads me to lie down in green pastures. He leads me to rest beside restful waters. He restores, refreshes, and repairs me from the damage I endured in the journey.” Ah, my friends, it is refreshing to experience the care of a loving Shepherd. Notice also the idea of restoration is closely entwined in this idea of rest. It is more than lying on a beach. It is restoration of what is lost in the journey to this point. Remember the preceding blogs when I described my physical, emotional, and spiritual exhaustion? These are the areas God restores when he leads us to rest. 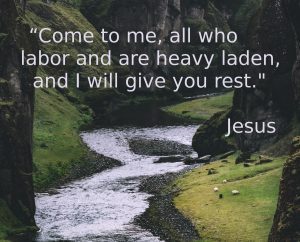 Jesus described it this way: “Come to me, all who labor and are heavy laden, and I will give you rest. Take my yoke upon you, and learn from me, for I am gentle and lowly in heart, and you will find rest for your souls. For my yoke is easy, and my burden is light” (Matthew 11:28-30, ESV). In this passage we see rest is something Jesus gives to us. “I will give you rest,” he says. But as with any gift, it is up to us to receive it. He offers us rest. We would gladly receive it but for the fact our hands are loaded down with things we want to accomplish. Unfortunately, until we can set our agendas aside, it is difficult to receive rest from God. Strong’s Concordance describes the word Jesus uses for “rest” as “to cause or permit one to cease from any movement or labor in order to recover and collect his strength.” It is more than a lack of motion. It embraces the restoration offered by God. Once we understand rest is as much a part of God’s plan as any other destination, we can let go and embrace the rest he offers. Personally, I believe this is where I am at this point in my journey. The past year was rough. But now God has led me to a place to restore the depleted areas in my life. My passion is renewed. My love for him is refreshed. Because of the lessons learned, I adore him with a deeper humility. I embrace this season of rest knowing that down the road he will likely lead me to places of difficulty where I will learn more in my relationship with him. The journey will continue. I will continue to grow as he continues to lead me along the path. As I neared the end of the Wilderness of Testing, a refreshing breeze brought the scent of green grass and cool water through the air. A change was coming. The difficult days of the season of testing were drawing to an end. A time of refreshing was just over the horizon. I welcomed it. But looking back over my shoulder, I was unsettled. Had I learned the lessons God wanted me to learn? Did I pass the test when it was upon me? This singular question haunted me. Had I passed the test? Throughout the Wilderness of Testing moments of failure were woven together with moments of success. It remained to be seen which one would color the fabric I now wore as a covering. Hesitantly, I looked at the fabric draped across my shoulders. To my astonishment, it was pure white. It had been washed in a river flowing from the throne of God. It had been washed in the blood of the lamb. It was washed clean. I had received the gift of grace in the Wilderness of Testing. I crested the hill. Below and ahead lay a long green sweep of grass hugging a gurgling brook. Trees planted by the stream reached across the valley to shake hands with others, fashioning a canopy of shade. I pulled the garment close around my neck, and headed down the path to the Valley of Rest. My friend, you are likely at one of the three stages I’ve encountered over the past few years. You may find yourself in the Valley of Wait, learning deep lessons in your relationship with God. Maybe you are in the Wilderness of Testing, and the trial is fast upon you. You wonder if you will survive. Take courage. A Valley of Rest is near. Some are in this place of rest. God is restoring you, strengthening you, preparing you for the next series of lessons he has prepared for you. In each season, take heart, knowing you are in the place God designed for you. Do not strive to go elsewhere. Take comfort, knowing his hand has guided you to where you are. He is with us in each place and season. He is fully in control. He is enough. Let’s look deeper into this passage. When Satan offers Jesus the kingdoms of this world, I do not think he was referring to political kingdoms and nations. I suspect he was referring to kingdoms of wealth, kingdoms of happiness, kingdoms of power, kingdoms of celebrity and fame, kingdoms of significance. These are the kingdoms of this earth. “Worship me,” he says, “and I will give you all this.” Note the passage says he offered Jesus “the kingdoms of this world and their glory.” He’s not just offering him kingdoms, he’s offering him their glory. This is key to understanding the basis of this temptation. It is the temptation to seek glory for ourselves. It is the temptation to take our eyes off God, and to worship anything but him. It is the temptation for self-worship. It is the temptation to seek our glory over God’s. It is the temptation to seek wealth, happiness, power, celebrity, fame and significance and the glory they represent. The problem with this is that none of these things ever satisfy. All leave us longing for more. Satan is a fraud. He offers glory, but fails to mention it will never satisfy. We want more. More significance. More money. More toys to play with. More followers on social media. More likes. More retweets. But none of it satisfies. Sadly, we’ve been duped. We bought the lie. We bowed down. And it left us empty. We rate our success based on the number of Twitter followers or friends on Facebook. I’ve done it. Lately I’ve questioned this. How much of my social media use is ultimately to promote myself? This is where we have to ask ourselves the hard questions. Satan offers us significance. God offers us the opposite. Jesus said “The greatest among you shall be your servant” (Matthew 23:11, ESV), and “Whoever humbles himself like this child is the greatest in the kingdom of heaven” (Matthew 18:4, ESV). Note he did not say the greatest among you will have the largest church. He did not say the greatest among you will influence the most people for the cause of Christ. He did not say the greatest among you will have the largest social media following. He did not say the greatest among you will have the nicest home, drive a newer model car, or live in the right neighborhood. He said the greatest would be your servant. “A dispute also arose among them, as to which of them was to be regarded as the greatest. And he said to them, The kings of the Gentiles exercise lordship over them, and those in authority over them are called benefactors. But not so with you. Rather, let the greatest among you become as the youngest, and the leader as one who serves” (Luke 22:24-26, ESV). If the disciples grappled with this issue, is it possible we do as well? I know I do. My desire for significance is an ungodly motivating factor in my life. I grew up in a difficult home environment where often I struggled. Most of my life I have felt insignificant, worth little, etc. I have a natural sinful desire to counter those feelings. It crouches in the background of my life. My whole life it has hidden behind the curtain on the stage, peeking out at me. I hear its whisper when I am preaching. I pray for influence. But does my prayer for influence come from a heart to see God’s kingdom made great, or do I desire to see my kingdom made great? Even just a little? Is my desire for influence actually just a desire for significance? These are the difficult questions with which I wrestle in quiet moments alone with God. I asked myself this question in regard to publishing the next book I’ve written. I spent time last year looking for a publisher and speaking with literary agents. Is my desire for a publisher just another example of pride? Do I want to say, “I am published by so-and-so.” Am I trying to find a publisher so I can feel significant? So many questions. In the original language, the command “Be gone, Satan” is the same statement Jesus says to Peter. 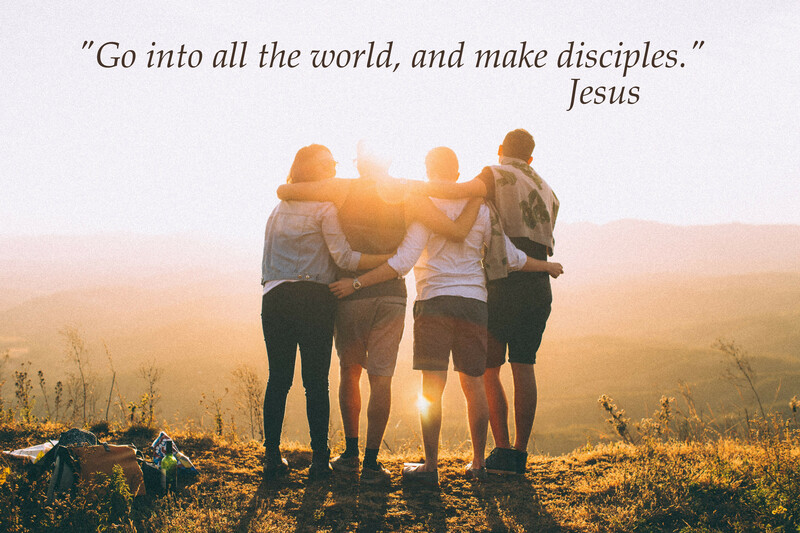 Jesus shared with the disciples he was about to go to Jerusalem to lay down his life. Peter responds, “Far be it from you, Lord! This shall never happen to you.” Jesus turned and said to Peter, “Get behind me, (be gone) Satan! You are a hindrance to me. For you are not setting your mind on the things of God, but on the things of man” (Matthew 16:22-23, ESV). There it is. Did you catch it? “You are not setting your mind on the things of God, but on the things of man.” He is referring to the kingdoms of this world, the things of man. It is the core temptation with which we all deal. Gratefully, Jesus continues and explains how we are to live. 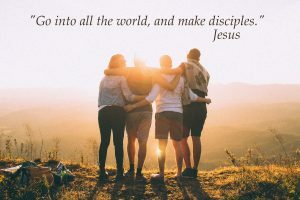 “Then Jesus told his disciples, “If anyone would come after me, let him deny himself and take up his cross and follow me. For whoever would save his life will lose it, but whoever loses his life for my sake will find it” (Matthew 16:24-25, ESV). Satan offers us the chance to be served. Jesus offers us servitude. Satan focuses on building wealth. Jesus focuses on the poor. Satan offers power. Jesus willingly set aside his power and submitted to death on a cross. Can you see the contrast? 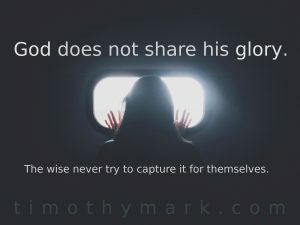 God does not share his glory. The wise never try to capture it for themselves. It never ends well. 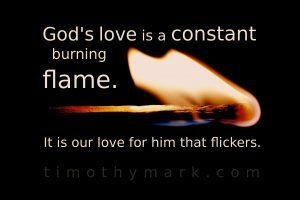 His command to us is to love him with all our hearts, all our minds, all our strength. All, not most of our hearts. All. He alone is worthy of our worship. We bow to him alone. While this may sound discouraging, what I found was greatly encouraging. It frees us to address each of these issues. It frees us to seek influence without significance. It frees us to seek ministry without titles. It frees us to serve without needing someone’s approval. Each area I addressed brought a brighter light of God’s glory into my heart. While difficult to process, it brought me to a new place in my relationship with God. For this, I am extremely grateful. As I mentioned in the earlier blogs, at the end of this Wilderness of Testing I was exhausted, mentally, physically, and spiritually. Good news, my friends, a season of rest is coming! In God’s plan, the Valley of Wait usually leads to a Wilderness of Testing. But the Wilderness of Testing leads to a Valley of Rest. We’ll look at this in detail in the next featured blog. For now, let’s review what we discovered in this passage. Satan offers us the kingdoms of this world – kingdoms of significance, power, prestige, celebrity, fame, wealth and glory – if only we bow down to him instead of to God. Be careful to worship God alone. God does not share glory. Don’t try to take it for yourself. It will not end well. Ask the hard questions. What are the motivating factors in your life? What actually drives you? Let the Holy Spirit dig deeply in your heart. Find freedom when you yield to his touch to transform your life in these hidden places. Bow to God alone. Love God with all your heart. The challenge here is the word “all.” It is one thing to say we love God. It is a far different thing to say we love him with all our hearts. “All” leaves no room for second place. The third test is this: Is God worth more to you than the kingdoms of this world and glory? May we do the hard work of addressing these issues in our lives. I thought you would enjoy this video, “How to get a boat with a 48 foot mast under a 47 foot bridge.” Our cast of characters include Billy the Tipper, his assistant, and my friend Bob. Continue reading below. Billy the Tipper is a living legend in the area. Yes, you cannot make this stuff up. Billy the Tipper met us at the bridge at 9:00 AM. He tied his boat to our port side and placed empty plastic fifty five gallon drums on our port deck. We secured the barrels to the deck with ropes. Then Billy started a portable pump and filled each of the drums with water from the canal. The weight of the water filled barrels tipped the boat to its port side, lowering the level of the mast to the water. Slowly we approached the bridge and confirmed we were low enough to pass. Once through, we reversed the process, emptying the water, and the boat returned to upright position. We settled up for his services and were on our way into Lake O. That, my friends, is how you get a 48 foot mast under a 47 foot bridge. As always, I enjoy reading your comments. Feel free to post your thoughts below.